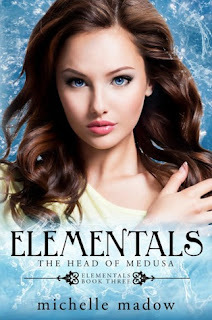 Vibin With Books: Elementals: The Head of Medusa by Michelle Meadow giveaway + excerpt! 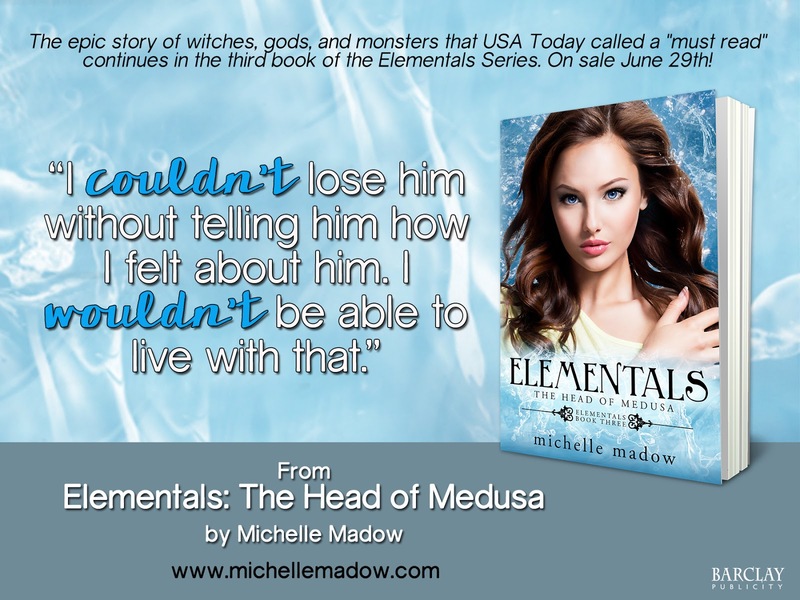 Elementals: The Head of Medusa by Michelle Meadow giveaway + excerpt! Follow the Elementals as they journey to the end of the Earth, facing choices that will put their lives and the entire world at risk. Will they all survive the mission? This book takes the cake for my fastest read. Even though it technically took me five days (life seems to enjoy getting in the way a lot), of the five days, it took me a grand total of 3 1/2 hours to read. An hour and a half for the first half, two hours for the last half. The first half was a struggle for me. I can blame some of it on my mindset: I was tired and rushing through the story, not really soaking anything in. My mom had the TV on as well, so I was constantly being yanked out of the story by something flashing on the screen. But I'm always a little caught off guard at first by how naive these characters are. They're very tame compared to some teenagers in books, so it's difficult at first to get used to the drastic changes. But that's just how Madow wrote this series, so it's really no surprise, but I'm always caught off guard in the beginning. Once I get used to it, I slip into the story like it's nobody's business. When she emailed me with the eARC, she mentioned that this was the most emotional book yet in the Elementals series, so I was ready for it. And I definitely see what she meant: some of the characters get gorgeous character arcs, and the group as a whole faces their toughest opponent yet, all the while dealing with personal relationships, suspicious foes, and shattering loss. I'm the kind of girl who reacts to a lot of blood and action in one way: vicious happiness and awe. So, at one point in the climactic scene, Madow goes full force and ratchets up the tension, and it was glorious. I seriously want to spill the specifcs, but don't want to spoil anything, so you'll just have to see. Nicole's inner turmoil and thoughts, though a little stiff at first, smoothed out beautifully by the end, ensuring a solid arc that had me rooting for her. I'm a little cynical, so it's hard for me to read about happy-go-lucky characters who are constantly optimistic and see the best in people. I like when things get a little dark, so, even though it pained me for Nicole to have go through it, I thought a little injection of real life was necessary for her to be more relatable. She's still such a sweet-pie though, and a small part of me really admires her for it. I can't imagine having the fate of the world on my shoulders at 16. No, thank you. With it's gnarly cliff-hanger of an ending, Elementals: The Head of Medusa will having you scrambling for more of Nicole and the gang as they struggle to keep Earth safe from the clutches of the Titans! "What were about to do is scary. Terrifying, even. But we've been through things that were just as challenging. We played our first monster together in that cave, we escaped the Land of the Lotus Eaters when everyone there was trying to kill us, we blew up one of Scylla's heads, we played the hydra, and we stole the Golden Sword of Athena from a goddess's ice palace. No matter what challenges we face, we've always come out on top. Tonight won't be any different. We're the Elementals. We train together, we fight together, and we win together. And don't any of you ever forget it." 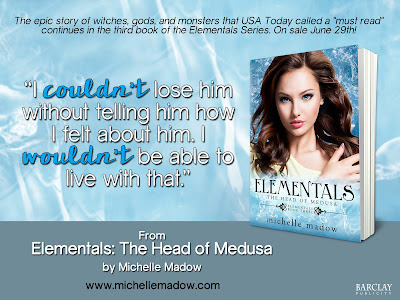 Michelle is offering up a fabulous prize during her Elementals: The Head of Medusa Virtual Tour event. One lucky winner will receive a signed paperback copy of the first book, Elementals: The Prophecy of Shadows! Michelle Madow writes fast-paced YA (young adult) fiction that will having you turning the pages wanting more! She grew up in Baltimore, and now lives in Boca Raton, Florida, where she writes books for young adults. Some of her favorite things are: reading, pizza, time travel, Broadway musicals, and spending time with friends and family. Michelle went on a cross-country road trip from Florida to California and back to promote her books and to encourage high school students to embrace reading and writing. Someday, she hopes to travel the world for a year on a cruise ship.